Why is it in all governments' interests to ensure that they and their policies are seen as credible? How is it that the British government manages to maintain a relatively high level of credibility? These were the main questions raised and addressed by Professor Stephen Nickell at the lecture I attended on Wednesday which was organised by and held at the University of Birmingham. 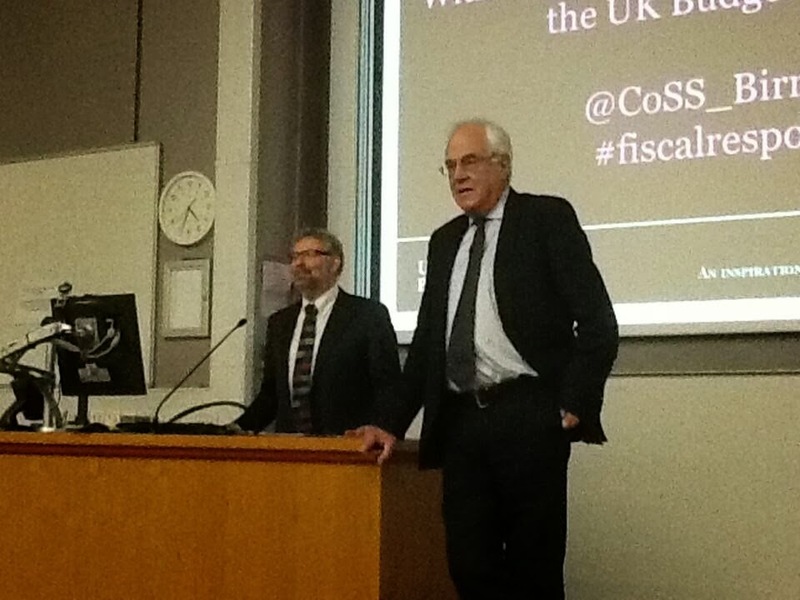 Professor Nickell, who is a member of the UK Budget Responsibility Committee (find out more about him here) started his lecture by answering the first of the two key questions. He explained that if a government plans to spend only as much as it plans to tax, and it is believed to follow its plans fairly stringently, people will be willing to lend to that government (by purchasing its bonds, known as gilts). However, if the credibility of the government is weak, people will want to be compensated through higher interest rates for the risks they are taking in lending to that government. 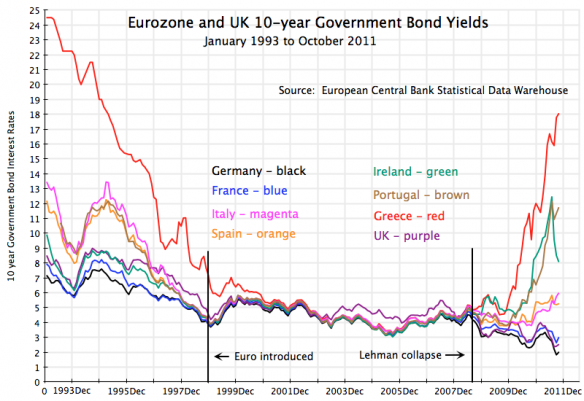 ﻿﻿﻿﻿﻿﻿﻿﻿Using a graph similar to the one below, he demonstrated that a prime example of this was after the financial crash of 2008, when the bond yields of Greece, Ireland and other peripheral members of the Eurozone increased massively due to the threat of their governments potentially defaulting on their debts. It was only after Mario Draghi, the President of the European Central Bank, announced recently that the ECB would do everything it possibly could to keep the Eurozone together that those countries' bond yields reduced somewhat.
" ...the rate at which the government pays its debts is important [for everyone]... To keep interest rates low, it is a good idea for governments to have credible fiscal plans." How does the British government maintain high levels of credibility? This was the question which Professor Nickell turned to address next. We were informed of how the Blair-Brown Labour government (1998-2008) attempted to smooth the (what seems to be innate) volatility in the economic cycle by making fiscal plans which constituted of rules such as only borrowing to invest, not to fund current spending (which includes spending on wages and salaries and expenditure on consumables such as drugs for the NHS). However, no independent board was set up to check whether the fiscal plans were being properly followed, and the government was not able to pinpoint exactly where on the cycle the economy was at any particular point in time. As a result of this, the government lost credibility at the time. Even though in hindsight their plan seemed to have worked for the cycle between 1996 and 2006, after 2007 the deficit "exploded" and their plan was "wiped out". In addition to those problems the government was systematically over-predicting its income through taxation and thus under-predicting deficit levels. Due to this, the outcome of the financial crisis of 2008 was worse for Britain than it might have been if the we had been aware of the deficit being quite a bit larger in reality than the reported 2-3%. What is the OBR? What does it do? How does it work? He started by telling us that the OBR's official task is "to examine and report on the sustainability of the public finances" and that the organisation is a non-departmental public body which cannot pass any judgements on any government plans. It has direct access to all government departments so that it can make its forecasts as accurate as possible and is different to most "fiscal councils" across the globe in that it does not provide commentary on the wisdom of government economic policies. Professor Nickell argued that the OBR is necessary (even though, understandably, its forecasts can sometimes be quite wrong) for a variety of reasons. His key reason was that governments need some framework for making decisions and, without a set of forecasts, it is not possible to decide upon good fiscal policy. In addition, he argued that having an impartial organisation such as the OBR is good for the country as the government cannot then "get away with fiddling around [with figures] behind closed doors". With the ONS (Office for National Statistics) and various government departments being accused of doing such "fiddling" numerous times (see here and here), I do think that this particular point is very important, although I'm not entirely sure whether the OBR does or doesn't do any "fiddling", as it is impossible for anyone to be entirely sure about these things without being a member of those organisations themselves. Weeks before the Chancellor delivers his Autumn Statement and Budget (in March), the OBR sends preliminary forecasts to the Treasury about whether the fiscal mandate has at least a 50% chance of being achieved. It is after this information has been carefully analysed by the Prime Minister, Deputy Prime Minister and the Chancellor that what will go into the budget plan is finally determined. Professor Nickell is shown here on the right. But how is the OBR seen as being independent and credible if it was set up by the government? The rights and responsibilities of the OBR are set out by an Act of Parliament. The OBR's budget is publicly announced. The methods of the OBR are published and the organisation responds to all requests for information. All of the OBR's meetings with the Treasury etc. are logged and made public. According to Professor Nickell, however, the most effective way in which the OBR proved its credibility was through generating an economic policy shift which was politically difficult. In 2011, he said, the economy suddenly looked grim even though 2010 had seen promising improvements, and inflation was much higher than expected partly due to the increase in VAT in 2010. Large spending cuts of £8bn for 2015-16 and £15bn for 2016-17 were then announced as a result of the OBR's forecasts. Although George Osborne, the Chancellor, did not want to make those cuts, they were announced regardless. This proved to be the wrong decision, as the OBR's forecasts had been overly pessimistic in hindsight, but, Professor Nickell argued, this example does illustrate the OBR's ability to influence government policy. To my surprise, Professor Nickell simply replied, "We don't include inequality in our models." He went on to explain this statement by stating that the economists at the OBR don't see inequality as having a great impact on the growth of the economy. Instead, it is believed that "productivity growth isn't everything, but it's almost everything". He explained that inequality is a result of the cost of living crisis, which is a result of the real wages crisis, which has been caused by the lack of productivity growth. Thus, he explained, it is productivity growth (or lack of it) which is included in the OBR's models instead of inequality. How can there be "too many" organisations like the OBR in existence if it is supposed to be unique in its impartiality (among other things) not only in this country, but also compared to its equivalents across the world? Why does the Treasury Select Committee have veto power over the OBR? It doesn't have veto power over the MPC (Monetary Policy Committee) which can make powerful decisions, so why does it have that power over the OBR, which is impartial and cannot make such powerful decisions? The lecture was very informative and I'd like to thank Professor Stephen Nickell and the University of Birmingham for organising it. I recommend that you readers go out and attend lectures too - then write about them and send in your articles! Tomorrow (Saturday 25th January) I'll be attending the Marshall Society's 2014 Conference in Cambridge which focuses on global development and which I am greatly looking forward to. I'll write about my experiences there as soon as I possibly can. Another very interesting article - well-written, too. It does seem somewhat bizarre that he'd comment that there are "too many organisations like the OBR" - perhaps he was referring generally to statistics-gathering organisations, like the the ONS? As for the veto power, I agree that it seems inconsistent to have this power over appointments to the OBR but not appointments to the MPC. That said, it seems that the Treasury Select Committee recently desired the latter, too; http://www.parliament.uk/business/committees/committees-a-z/commons-select/treasury-committee/news/governance-at-bank-of-england-too-weak/. It may be that, as a new organisation, the Treasury Select Committee was able to push for veto power when the OBR was formed. But, as the MPC is an older institution, they can't push with the same force for veto power over that. Thank you! Yes, it could be that he was referring to organisations like the ONS, though I'm pretty sure I heard him correctly... Can't rule out the idea that I just misheard him, or he misspoke. Hmm, it definitely seems plausible that the age of the institutions could be a big factor as to why the veto power hasn't been introduced.